12 each Angus Beef Meatballs (1 oz) You may substitute any variety of Cooked Perfect® Meatballs. 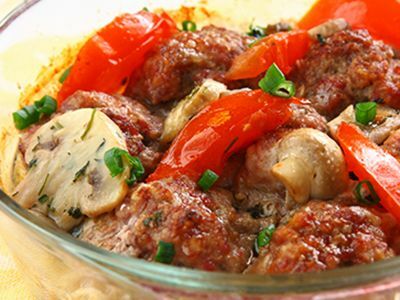 In a skillet heat the onions, peppers and mushrooms and cook for 10 minutes, stirring often. Add the meatballs, tomatoes and seasonings and continue to stir. Pour the stew into a chafing dish and bake for 20 minutes.